They want to learn about the world around them. During VBS this week they also want to beat the boys in fundraising. There was talk of a lemonade stand, which quickly turned into a cupcake stand. They decided to give half of the sales to VBS which is raising money to purchase Memory Bags for Royal Family Kids Camps, and half to our friends from Hope For Sudan, who are mobilizing a massive feeding program. While the little ones slept, we baked and frosted. We gathered cute decorations for our table. It was decided to park our stand out in front of youth group. Hungry teenagers cannot resist the cupcake slinging of little faces. The cupcakes went like hotcakes. If hotcakes were cupcakes. In one little evening, the girls raised way more money than they ever hoped. Enough money for over a thousand meals in Sudan, and quite a few Memory Bags. All because they wanted to bake cupcakes. In this season we cannot give much financially. We cannot go to Africa. But we can bake cupcakes. I can make some printables. We can use our small things for the work of a very big God. "We’re not all called to go to Africa. But we’re all called to do something." your kids are rad because YOU and Jason are rad. A million thanks. I'm sobbing in my car. 10 of each, please. I whole heartedly agree! We all can DO something! Can you imagine what would happen if we all did?!? This is awesome, their hearts are beautiful! I love the verse on your printables - I made a big art piece to hang over our couch this past january that has the same verse on it. :) Daily reminder. 83 meals vs. 1 coffee- no comparison! Thanks for being such an awesome example for your kids! love it. getting one of those. micah 6:8 is one of my favorite verses of all because of how simply it boils down what god requires of us. when i feel overwhelmed, i think of micah 6:8. i think in the original language, there are bullet points (for people like me). So wonderful! I just bought one and am sharing it with my readers. Hi from Australia. I came across you blog via pinterest and just wanted to support this. Love Jess's quote. I'm reading an awesome book called Radical by David Platt and it fits exactly with the message in it. Well done and be encouraged in all you are doing. Thank you, thank you, thank you!! 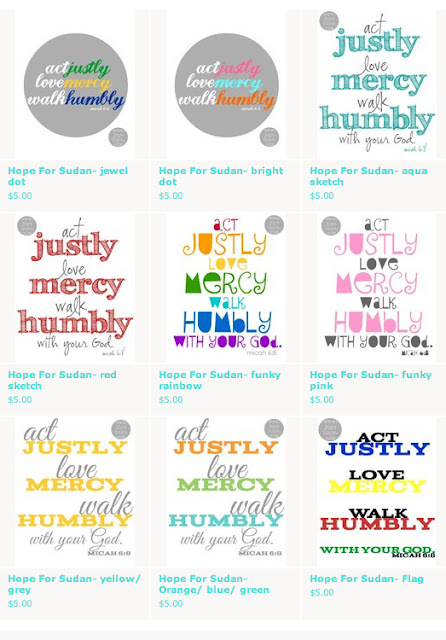 :) Just got my printable, and I'm so excited to see what God is going to do in Sudan! I love you and your amazingly big heart and your amazingly big hearted kiddos. Amazing. Simply amazing. Your spirit and heart bring tears to my eyes. I will be purchasing a print or three later today :). How fantastic Julie! I served as a counselor at Royal Family Kids' Camps in the Phoenix area years ago, and let's just say the experience completely changed my life. I am getting goose bumps even as I right this. That was my "something" back then. Fast-forward to now and my something is writing devotionals to encourage others in their faith walk and to bring the light of Jesus to those who don't know Him yet. And here's the kicker: I can't number the times God has used what He gives me to write to minister me! We absolutely serve an awesome God! Cheers to you for showing your children early on that giving back is an important way of life! Great mama! seriously julie, i am so encouraged by your family! thank you for teaching your little ones the importance of caring for others and encouraging creativity in how they show compassion! i want to be your kid... cute, jesus moving, eating lots of sweets, around your witty personality.